Happy New Year everyone! As I am approaching 100 subscribers I thought I would reflect on the past couple of months. 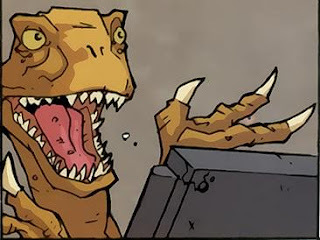 After on a whim deciding and picking a name and starting my blog I released that most people that actually read what little I write don't really follow Starcraft, which makes my blogs title somewhat redundant. I choose the name because it rhymed even though it was grammatically incorrect. I also found that while I still love Starcraft, when writing I prefer to talk about current events or what I have been up to in real life. After some thinking I decided to put the bulk of my Starcraft content in video format for my youtube channel I think this is a better medium, since video games are a visual thing themselves video works a lot better than text. Some quick thoughts on youtube, its a lot harder to get subscribers than on blog sites. Most people will sub to you on blogs if you comment on them, even if they don't follow you just as a courtesy, on youtube its a lot harder subs but a lot easier to get views naturally. Every time I get a new sub on youtube I smile, new subs on blog doesnt really excite me as much, but for blogs its more about the comments you receive because you know at least they have glanced at your page, even if it was just to say "cute kitty"
In some world News: Aussie woman survives bungie jump cord break into crocodile infested water. haha the cat will have his day. You it is harder on youtube but again I don't do much there either. I mean yeah you're right about the youtube thing. I knew friends that had videos take off easy, yet we I do it they almost seem snail-fast in views. Just stopped by to say cute kitty! Just realized I was not following you! But that is a cute kitty. I know what you mean about youtube. I rarely get followers and when I do I cheer! Getting views means nothing in youtube cause you can never tell if its someone watching your video or accidently clicking on it when an ad pops up and pushes all the related videos down one spot! 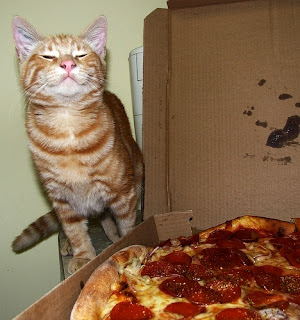 That cat is thinking "He gave me some pizza...I love pizza..."
omg !! that cat is gonna eat that pizza ! HE NEEDS TO BE STOPPED! A New Zealander? I'm jealous. New Zealand has, from what I've seen in my friend's pictures, the most gorgeous natural scenery yet. Haha that cat looks like dauyyyyuumm hot pizza!! I can't wait to see whats going to happen in GSL. I have yet to make a Youtube video and start doing something with that account. No ideas have come to me yet. The pizza looks good, an the cat thinks the same, man poor girl of the bungie jump!. As for YouTube - no idea - I tend to look it up when I want to be reminded of a song I like or if a blogger wants to show a link to something. I much prefer reading blogs though! So I hope you don't give up the written word altogether! p.s. as for that poor woman who survived the bungee jump - I think the minister for tourism (or something akin to the minister for tourism) did the same bungee jump a few days later to show the world that all is well now. Oh dear!